Here at StarCircleAcademy we’ve been consuming and testing quite a number of photography related apps. So far none have risen to the promise that a handheld app could bring to the table. Rather than illuminate what is missing from each app, here I describe what I want to DO with my handheld App. First, I need an app with accuracy to within 0.2 degrees! Why? 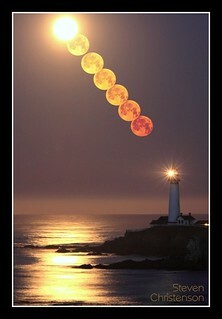 Because the moon and sun are only 0.5 degrees in angular diameter. 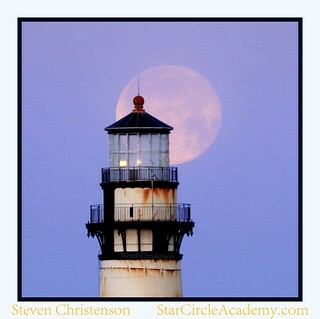 If I want to catch the moon exactly behind the Pigeon Point Lighthouse less accuracy will result in a “miss”. I want the app to accurately measure and save all the relevant data so I can reuse it and share it. At minimum it needs to keep track of: From location, to location, altitude at the to location (degrees above horizontal), and any additional constraints like the fractional number of degrees that each measurement can vary. In some locations like the shore of a lake there is more leeway to move. In other spots, like the balcony of a building there is little leeway to move. An ideal app would allow me to stand in two or more different spots to define that leeway. If I’m solving for the moon, I’d like it to also remember the moon phase I’m interested in (usually full or slender crescent). The ability to take notes including things like height of the landmark is a big plus. Ideally I can save an image representing what I want with ALL data on the image so that if all I have is a photo, I can reconstruct the parameters in other tools or other ways. For example, SpyGlass shows me my GPS coordinates, the elevation, altitude and azimuth (compass direction) – though as you can see it’s calculation on where to find the moon is off by about 15 degrees (30 moon diameters) due to iPhone 4 compass inaccuracy. SpyGlass snap. 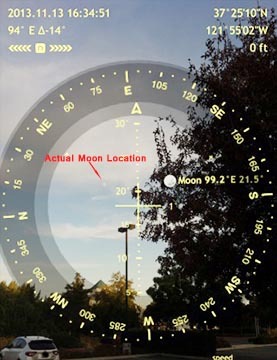 Note that the plotted location of the moon is off due to iPhone compass hardware. I’d like to be able to pull up my saved locations and re-execute a search to find the next occurrence. For example, a Pigeon Point Lighthouse vista that I really like only occurs a few times a year. It’s not enough to keep track of the one event I photographed or plan to photograph. Bonus points if the data is stored in a server somewhere to make it easy to share. Extra bonus points if there is a way to have the server periodically check possible alignments and send me alerts or emails when such alignments are soon to become possible. For planning shots with the Milky Way or other prominent sky features (like the Andromeda Galaxy and the Great Orion Nebula), the app needs to accurately plot the course of those objects on an Augmented Reality frame. Images of the Milky Way presented must be realistic. A poorly illustrated Milky Way won’t help me find the galactic center (which is what I most often want) or compare the alignment I want with the foreground I am trying to capture. 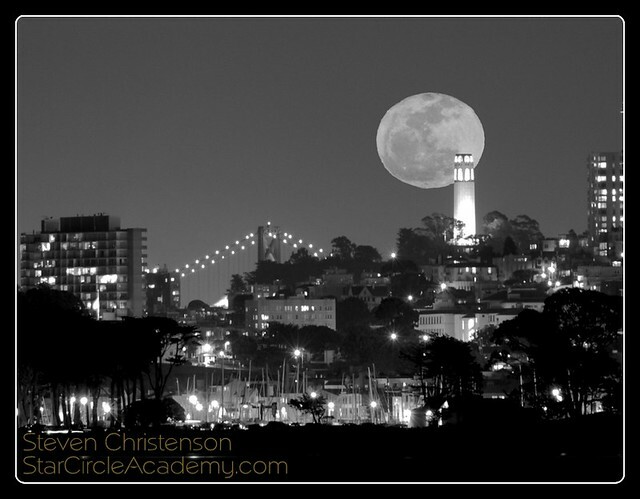 For night related photography, the app must also factor in twilight and moonlight. That is, I want to be able point my device at say the Transamerica building and ask the app when (or if) the Andromeda Galaxy will appear above it when there is little or no moonlight. Make it easy to use, of course. Most of the apps that embed maps in them are difficult to use on the tiny real estate of an iPhone – and require data connections as well. Is it unrealistic to think a handheld app could meet these requirements? I don’t think so. The biggest problem is overcoming the accuracy limitations in the current devices. The iPhone and iPad, for example have quite inaccurate compass readings except in perfect scenarios… but there are some clever ways (I think) to correct for that inaccuracy. The tilt angle calculations from the on-board accelerometers and gyroscopes seem to be pretty accurate. Inclinometer. Great for measuring angles above the horizon. Even has a voice mode where it says aloud the measurement. Doesn’t do Now includes augmented reality mode so you don’t have to sight along an edge of the device. On an iPad, it seemed to be accurate to about 0.2 degrees! GoSkyMap. Fun interactive sky map. You can change the date / and time and point it “at space” and it will show you great details about what is there. BUT you have to make sure you set the location correctly. Doesn’t have an Augmented Reality mode so you can’t tell how the mountain in the foreground interacts with the Milky Way, for example, but you can ask it where to find constellations and it will indicate which direction you should look. Sky Map. Like GoSkyMap it’s an interactive planetarium. I prefer to use it without the “point features”. It’s my Planosphere (Sky chart) in hand. Also includes things like Meteor Showers and radiants, a list of “what’s up tonight” showing rise and set times, moon phase, etc. No Augmented Reality. PhotoPills. Lots of things rolled into one app. Biggest complaints about this app are saving and reusing Plans, usability quirks, a grossly oversized moon or sun icon in the Augmented Reality modes and an inaccurate Milky Way representation. Oh, and I’d really like it if it would measure for me! The planner would be great if I could have the Augmented Reality compute the Azimuth and Altitude (aka Elevation) for me, especially since it doesn’t seem to have a way to measure like the Inclinometer tool does. I see, for example where someone saved the “Manhattanhenge” event. It would be great if I could load it and click “find next occurrence”. That feature alone might be worth booking a flight to New York! SpyGlass. Clever app with lots of onscreen information in Augmented Reality mode. We especially like the onscreen measurements which are saved when you grab an image. Do you know of an app that’s highly accurate and will meet our requirements? Let’s hear about it. If it exists on an Android I’ll buy an android! Steven, interesting article, fun to read as always. Thanks. In point 3, where you find the real moon position to be 15 deg to the right of predicted, I have also found my apps – iPhone compass, Handy GPS – are off by the same amount, and it’s pretty consistent. I have assumed it must be due to the difference between true north and magnetic north, which varies according to where you are, so presumably the app-makers can’t adjust for it. Do you think this might be the case? The iphone compass has a setting for true north or magnetic north – and this setting is not necessarily related to what an app that uses the same data does. The magnetic deviation is well known and easily adjusted for except very near the north magnetic pole, so no, it’s not strictly due to the magnetic declination. I mostly use Moonseeker combined with SkySafari. This post makes no mention of them. So,are all of the mentioned apps more advanced? I like the calander on Moon seeker. Helps me with planning. Thanks for the tips. As you’re probably aware there is whole flotilla of apps for these purposes. I don’t know that I can say there is a clear winner. In fact, we have MoonSeeker, too. I FORGOT I had it. I like the phase and calendar display of Moonseeker It’s a bit better than PhotoPill’s display. The Moonseeker moon in augmented reality mode is, however, excessively large just like PhotoPills so even if it were accurate, it gives a grossly exaggerated idea of what your image will look like. Selecting dates in the far future on Moonseeker is a bit painful, and it’s not at all clear how you select different locations. Moonseeker suffers the same inaccuracy problems that all the other apps seem to have. I do like that Moonseeker gives the Azimuth and elevation where you’re pointing. PhotoPills should add that (but again, the azimuth is likely to be wrong)! We haven’t tried SkySafari, but like most apps of the kind, it’s a lot simpler to use a paper Planisphere to get a rough idea when the right time is to see the Milky Way. A planisphere simultaneously shows you all dates and times the Milky Way will be in the same location. I like to use both Sky Guideand Dark Skywhen I go out at night. Sky Guide is similar to goskywatch, but better in my opinion. It has I think all of the same main features, point and view, time view, and has orbits of rockets, comets, and the ISS. The selling points for me on this app is that is shows moon phases and illumination, and their HDR setting that allows you to set the visibility level of the stars as viewed in an urban lighted area to no lighting. No augmented reality capability though. Would be cool to create an app that allows users to add their own transparency layers to see what it would look like though. Dark Sky app was a no brainer. Living here in FL makes it somewhat difficult to find a place without light pollution. This app is a lifesaver. It’s like the iPhone map app but you can toggle a light pollution layer to find brightest and darkest areas in the US. Thanks for your thoughtful review. I stumbled upon this article as I was researching how to find where the Milky Way would be in the sky tonight. I followed Lee Rich’s suggestion and got SkySafari on the Mac App Store and presto! There it was! Super easy to customize, very intuitive and I can’t possibly imagine how it could be “a lot simpler to use a paper Planisphere to get a rough idea when the right time is to see the Milky Way.”. Couldn’t be any easier or faster or more fun than with this SkySafari app. Thank you for the article! The representation on the app is NOTHING like what it may look to your eye in your location. Every app suffers from this in one way or another. 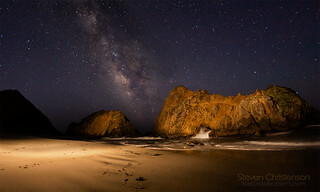 You want an idea when it will be BEST to get the Milky Way aligned over your target. Using an App this is a painful manual process of adjusting the time. On a Planisphere you spin a wheel and it reveals every time of night over the next six months when the sky will look the same (all at once!). An app could work better here because it could also inform you how much and how bad the moonlight might be, but I’ve seen few apps that do that well (if it all). You trust the app to tell you where it’s pointing and/or you are able to determine where you’re facing on your own. BUT due to iPhone, Android, and iPad hardware limitations, a handheld app could be anywhere from close enough to off by 180 degrees! Dead battery. Planisphere requires no batteries (to view them you can use a dim red light). Where as an app can destroy your night vision. The app shows you only a fractional portion of the sky… confusing you. The context of this article is in planning a shot, so the example of using a Mac or PC based application doesn’t really apply – there is no correlation to the actual landscape. I ran into a guy with SkySafari in Yosemite explaining to his kids that “over there is Orion”. He was way off. The first reason he was wrong was he didn’t have the time and date set correctly. Second he didn’t have his GPS location correct (he was from Florida and that was the GPS coordinates his app was using. Everything was off by 3 hours) and finally his in-app compass was telling him he was facing EAST when he was in fact facing SW! Trust us when we tell you that our event participants who are provided with planisphere generally prefer them to their apps! Now after all that, we’re NOT saying all apps are useless. Quite the contrary. If you already know your sky moderately well and can orient yourself properly there are many useful tools at your disposal including apps (we use Stellarium a lot!). Thanks for your reply, Steven. Please understand that I have no horse in this race. I agree with you that a planisphere is extremely versatile and useful. One question though: Have you actually tried SkySafari? I think for $5, it will answer most of your (very valid) questions. Now obviously if the user can’t even set the time zone and location properly (just as you need to do on a planisphere), then we’re talking about a whole other set of problems. Bo, Glad to hear you like SkySafari. A planisphere is a sheet of paper (or plastic or cardboard). There is no getting the location wrong – a planisphere is good for a range of latitudes. The only thing you can mess up is getting the time wrong – but at most you’re likely to be off an hour during daylight savings time. Have you used one? The list of apps (both desktop and iOS based) we’ve used is long (see the articles). SkySafari is published by the same company as other apps we have used. But no, we never bothered with SkySafari since Stellarium and a half dozen other programs that we obtained are free. SkySafari has plenty of gimmicky stuff in it “flying through space”, constellation art, and more. 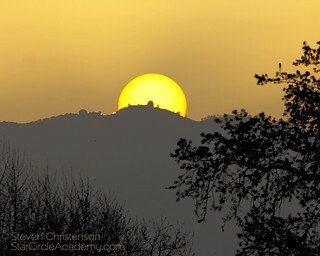 In our opinion none of that will help you learn the night sky or directly solve the problems that we discussed in this article. We’re not saying the app is bad, we’re saying a planisphere is more effective for casual observers, for planning shots with the Milky Way, and learning the night sky. In fact, I’d liken it this way: if you navigate with a real map in your car, you’re much more likely to learn the streets than if you use a GPS that’s telling you which turns to make. One other thing to keep in mind is what platform you purchase the app on. We certainly agree that having an app on a phone that you carry with you is an advantage over a desktop machine or even a planisphere… but the advantage is in portability, not suitability for use. Still, we’ll throw some $ at Simulation Curriculum Corporation – even though their Starry Night software was a disappointment and see if SkySafari really is better than StarMap, GoSkyWatch, or any of the other portable night sky apps we currently have loaded. By the way, beware of all of the “top ten astronomy apps” type reviews. Most are clearly written by people who don’t have a clue about the night sky and thus don’t know what features makes an app a good one.